LOGAN, Utah – Jordan Hicks has been named Utah State’s head strength and conditioning coach, it was announced Tuesday by Aggie head football coach Gary Andersen. 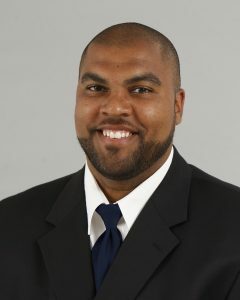 Hicks comes to Utah State from the University of Utah, where he spent six years (2012-18) as the assistant director of sports performance for the Utes. During his time at Utah, Hicks worked with the football program from 2015-18 and with the track & field program from 2012-14. Prior to Utah, Hicks was the director of strength and conditioning at North Alabama for the 2010-11 season. Hicks began his career in strength and conditioning at Kentucky, where he was a graduate assistant/intern in 2009. Hicks, a former defensive end, played collegiately at Southern Illinois (Carbondale, Ill.) in 2000 and 2001, then transferred to Georgetown (Ky.) College in 2002. After graduating with his bachelor’s of science degree in kinesiology in 2005, Hicks signed with the Oakland Raiders as an undrafted free agent. Besides his stint with the Raiders, Hicks spent time with the Tampa Bay Buccaneers, as well as the Hamburg Sea Devils and Amsterdam Admirals, both of which were part of NFL Europe. Born in Oberlin, Ohio, Hicks was raised in Lebanon, Ohio, and graduated from Lebanon High School. While at Lebanon HS, Hicks earned all-state honorable mention honors, won a state championship in football and played in the North-South All-Star Game. He also played basketball for the Warriors. Hicks has earned his CSCS Certification from the NSCA. Hicks and his wife, Candi, have two sons: Sheldon (4) and Hudson (2). His older brother, Reese, is a scout for the Atlanta Falcons, while his twin sister is the associate head women’s basketball coach at Louisiana Tech.